Send your little one off to dreamland with the stories of 100 strong women in this inspirational book. Joan Jett loved rock 'n' roll. When she was 13 years old, she got her first guitar. And once there was a girl who loved school. Her name was Malala Yousafzai. Send your little one off to dreamland with the stories of these strong women and 98 others in this inspirational book. From mathematician Ava Lovelace to architect Zaha Hadid, each extraordinary tale is paired with an equally extraordinary illustration and quote. Give a copy to the kid in your life. All of them. No, really. Printed in Canada. I wish there was more info about each woman! I love this book, the art work is amazing. My niece didn't put the look down and was showing it off to her friends. Theres alot of people in the book I have never heard of before. The book is beautifully written and has attractive illustrations, perfect for reading to younger audiences. I'm excited to give this to my niece! Great book with amazing artwork! Great gift full of amazingly independent women for the future amazingly ndipendent women in your life. 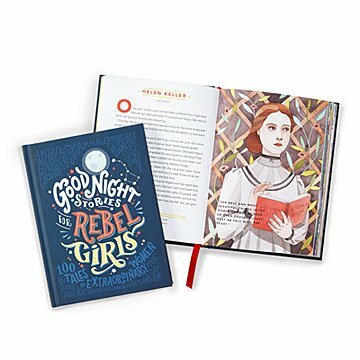 This is a gorgeous sturdy book that gives a one simple to follow single page story on some incredible women throughout history. Great way to introduce children to historical figures. I will be purchasing this book in the future for others. This book is gorgeous! It feels expensive. It is bound nicely. It's beautifully illustrated. The stories are short enough to read quickly and engaging enough to keep your attention; maybe even interest the reader enough to want to find out more. The women whose stories are told are from a wide range of cultures and all are strong, intelligent, bold, and courageous. Perfect real life heroes to inspire young women.